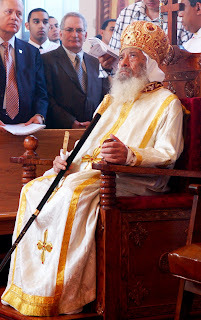 On Saturday, March 17, 2012, His Holiness Pope Shenouda III, the faithful and mighty shepherd of the Coptic Orthodox Church for over four decades, was taken up to heaven to be joined with the saints. Please join the Coptic Orthodox Archdiocese of North America as we gather in celebration of the life of His Holiness Pope Shenouda III and prayer for the future of our beloved Coptic Orthodox Church on Sunday, March 25, 2012 at 3:00 pm at St. Mary Coptic Orthodox Church of East Brunswick, 433 Riva Avenue, East Brunswick, New Jersey 08816. His Holiness leaves behind a flock of millions of Coptic Orthodox Christians spread over six continents who grieve for his departure, but rejoice in the knowledge that he has gained the reward for which he struggled, and is now united with our Heavenly Father. In all things, His Holiness was a devoted father and teacher. Despite his innumerable competing responsibilities and obligations, he never desisted from his weekly lectures, continuing to prepare and offer them even while in the throes of his illness. His millions of children throughout the globe learned not only from these weekly lectures, or his countless books and publications, but by the example he set as a model of discipline, courage and compassion. His Holiness’ papacy saw an unprecedented expansion in the Coptic Church throughout the world. It also marked revivals in Sunday School education and monasticism that will impact generations of Coptic Orthodox Christians to come. Yet, we remember him especially for the genuine love with which he cared for his children for over forty years and the true joy he displayed in Christ. May God repose the soul of His Holiness Pope Shenouda III and give heavenly comfort to his children. All are welcome to join us in prayer and remembrance. For further information, please contact Andrew Abdou at 908.812.8061 or andrewabdou@saint-mary.net.